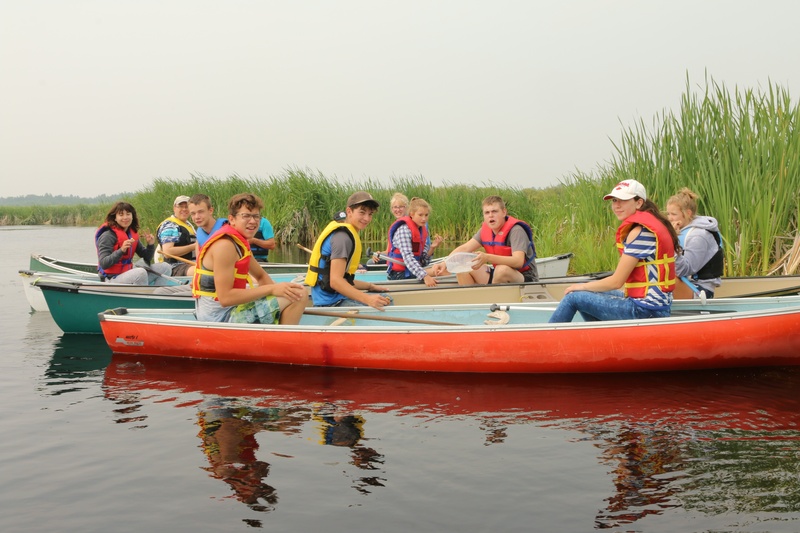 Canada’s summer camp for youth celebrated its eighth season. With 32 campers, their families and the necessary volunteers, 70 people in total came to camp in the Darwell, Alberta, area. Teen staff and campers at Camp Wild Rose in Canada. The weather was wonderful, with only one thunderstorm to contend with and a morning of rain. The calm, experienced staff took the schedule changes in stride and everything ran smoothly. Many volunteers prepared lessons and activities, put together games, and helped organize and supervise the programs. This year, the children built and painted clay pot bird feeders at arts and crafts. They participated in team sports such as soccer, volleyball and kickball. They learned paddle strokes, water safety and teamwork while canoeing. Archery continued to be a favorite at camp. Teamwork challenges taught godly character traits of patience and cooperation. The abundance of frogs on the property made the swamp expedition and nature lesson very profitable! The rainy Friday morning brought the campers indoors, but the little ones were kept busy playing group games, while the older campers had dance lessons. Partner dances such as the polka, waltz, two-step, box-step and jive were practiced. They also had fun with a few line dances. They were able to demonstrate their new dancing abilities on Friday evening before the Sabbath at the family dance. This year’s camp was extended to include the Sabbath, which was pleasant and a unifying experience for brethren. The day of rest was appreciated after three days of activities. Bible games and Sabbath school entertained the children, and Rick Berendt came out as a guest to lead the teens in a Bible study. Sabbath services included youth participation in song leading, opening and closing prayers, special music and scripture reading. Rob Eckert gave a sermonette on “being holy, as our God walks in the midst of our camp” and included five children to assist in reading the scriptures. Bob Berendt delivered a sermon about our great God’s divine creation and our place in it. This year’s theme was “Growing in God’s Garden,” with the feature scripture being Deuteronomy 23:14 Deuteronomy 23:14For the LORD your God walks in the middle of your camp, to deliver you, and to give up your enemies before you; therefore shall your camp be holy: that he see no unclean thing in you, and turn away from you. American King James Version×. Morning orientation, called “Peanut Butter and Jam Time,” focused on holy conduct, teamwork and being separate from the world. Christian living lessons were themed with God’s garden in mind, and worked on concepts such as giving good gifts, growing our fruits spiritually and recognizing God’s presence all around us. Another new aspect to camp this year was the inclusion of our youth ages 16 and above in the role of junior volunteers. These young people truly added to the camp with their youthful enthusiasm and energy. They were assigned leadership roles coaching soccer and kickball, supervising young children in tents, assisting with the primary activities, decorating for the dance and organizing all the picnic games on the last day of camp. They were also given opportunities to participate in their own activities. It was encouraging to see our teens gathered around the fireside in the evenings for social hour. Thanks to our cheerful and efficient kitchen staff for all the delicious and healthy meals, snacks and treats.The ice cream sundae bar at the family dance was a hit! Thank you to all who support, not only our youth, but our whole church, in this endeavor to build a Christ-centered spiritual family! It was a wonderful camp experience for all ages. We encourage you to join us next year!